To use Kello, place the microphone input of your iOS device against the watch that is to be evaluated. For best results, lay the microphone on a soft surface, that will absorb sound, and place the watch on top of the microphone. Kello averages the instantaneous rate of timekeeping measured over several seconds in order to give a reasonably accurate indication of how well the watch will keep time over the course of a day. To get the best result, keep the watch and microphone steady, in one position, for at least 30 seconds to 1 minute. Pause and restart analysis following a change in the position of the watch. For example, when changing from dial up to dial down, or crown up to crown down positions. It is important to use Kello in a quiet environment as noise pollution can interfere with the accuracy of the reading. To get the best reading, adjust the signal amplification and microphone position until the signal waveform displays clearly defined peaks, like those in the example displaying the rate above. When Kello is able to make a clear reading, the light indicating signal quality will glow steady green. To help reduce reverb when analyzing a watch movement in its case using a standard headset, place the microphone face up on a soft surface that will absorb sound, such as a blanket, and then lay the watch on top of the microphone. Avoid pressing the microphone firmly against the watch case. When analyzing an uncased movement, support the movement in a movement holder, or similar aid, and fix the microphone approximately 10mm from the movement, near the escapement and parallel to the mainplate. Press the 'Start' button at the bottom of Kello's application interface. If the frequency has not been set manually, Kello will first analyze the incoming audio signal to determine the frequency of the watch. Once the frequency is known, Kello will begin collecting signal data to evaluate the daily rate of the watch. When the signal is stable and enough data has been collected, a measurement of how many seconds per day the watch is losing or gaining will be displayed in the interface. 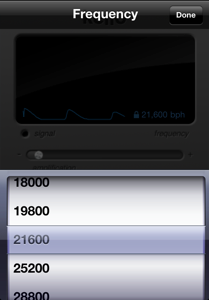 To manually set the frequency of the watch being evaluated, tap on ‘frequency’ in the main display area. A scrolling, selector view will appear and the frequency can be set by dragging the scroller up or down. To dismiss the frequency selector, tap the ‘Done’ button in the upper right corner of the screen. When the frequency has been set manually, a lock will appear in the display beside the frequency value. To set Kello to automatically detect the frequency of the watch, select ‘Autodetect’ in the frequency selector view.